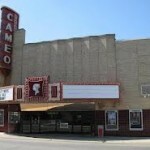 The 1929 theater closed in 1980, then was restored and opened again in 1987 to show movies. It closed again in the early 2000s and now has been opened again, and presents musical performances. The historic building has its share of haunts. Employees say they’ve heard footsteps, seen apparitions, and smelled the waft of ghostly cologne in a restroom upstairs. The site has been featured on many TV shows. 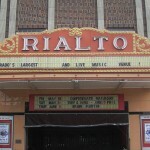 When I was 12 or 13 my friends and I would occasionally watch movies here at the Rialto. I remember one night me and my friend went upstairs to use the bathroom. Several odd experiences happened in the short trip to the bathroom. For Starters, when my friend tried to open the bathroom door it was locked. However, when I tried to open it… it was completely unlocked. Then when I went to wash my hands, things were literally falling apart. I turned the handle to turn the water on and the handle to the sink and it completely came off. I wasn’t being rough at all. Then when I went to get soap from the dispenser on the wall, it fell off the wall. I was thinking Oh crap! These people are gonna make me pay for this… Then I went to get some paper towels from the paper towel dispenser on the wall and the very same thing happened. What are the odds that these things would all three fall apart just from a simple bathroom break? I just felt like it was VERY odd. I was not being rough with any of it.